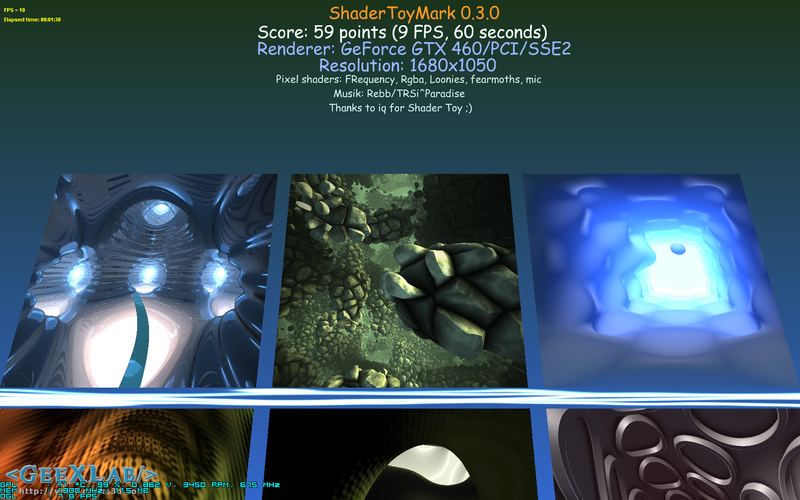 The third update of ShaderToyMark, the coolest pixel shader benchmark, is out. ShaderToyMark 0.3.0 does not include new features but comes with some bugfixes thanks to the latest iteration of GeeXLab. 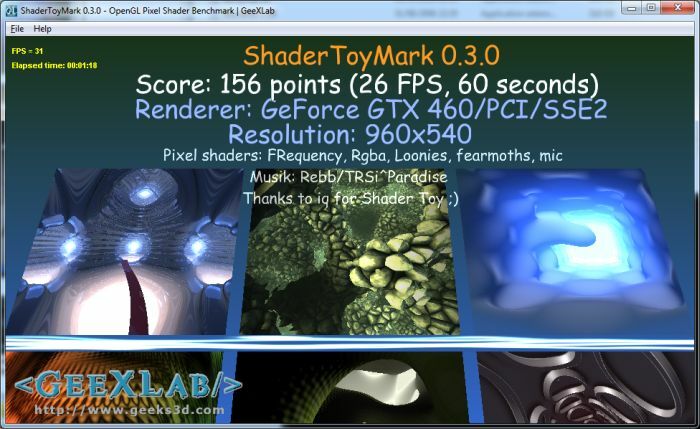 ShaderToyMark is an OpenGL benchmark based on hefty pixel shaders. These pixel shaders (all credits are available HERE) have been written by demomakers and are available on iq’s WebGL app: Shader Toy. 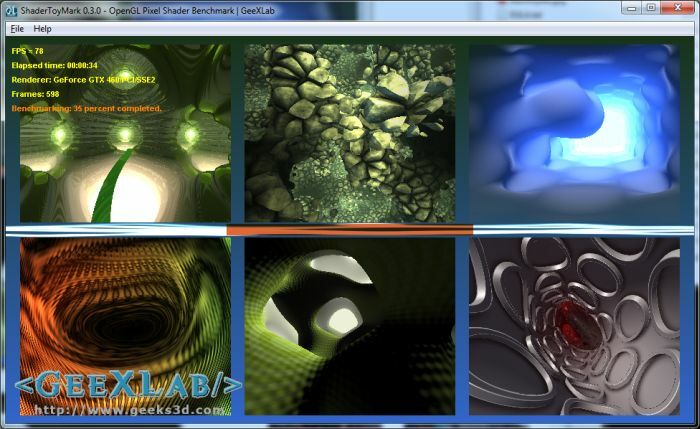 ShaderToyMark is an application built with the GeeXlab demotool. 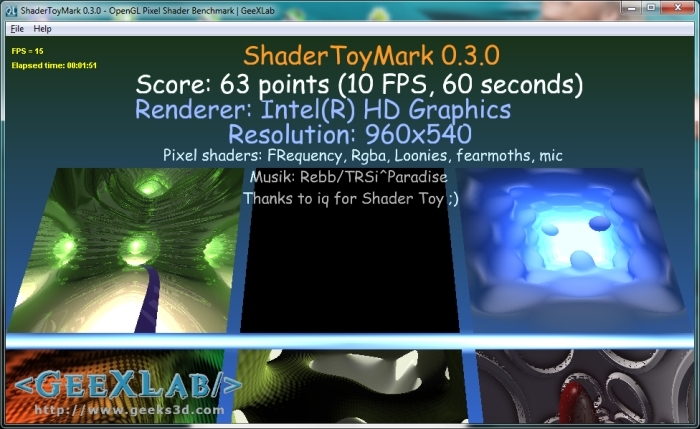 ShaderToyMark is perfect to rank the raw processing power of modern GPUs. Check out the scores page to have an overview of the scores. SLI and CrossFire multi-gpu technologies are supported. Just use the tricks detailed HERE. Please put the program into a folder within the zip file! Something does not become less objectionable by not having been objected to by Steve Jobs, that would be a logical fallacy. Futhermore, when they first presented the iPod, their presentations where much worse than today. And lastly, while similar, the font used in the in the presentation is not Comic Sans. @Font Nazi: what more do you want for nothing? Okay guys, the story about the font is interesting, but can your GPUs handle this benchmark? That’s a bit more than nothing. On top of that, I rightfully questioned the usage of the font as my membership in the Font Nazi Party demands. I’m not *asking* for anything, I’m merely giving feedback. @Stefan: model of your HD Graphics: hd2000, hd3000? I have Win7 x64 with AERO enabled and GTX 480 (stock+reference speed) with 285.62WHQL (HQ). ATTENTION: Very hot causes performance decreased abnormal after 1st time test but you must increase speed FAN from auto default to auto custom or manually 100% speed using EVGA precision or MSI Afterburner or other tool. You look my previous post. @nuninho1980: you have a problem of overheating? What is the temperature of your GPU during the test? No, it’s occasion (peformance/freeze/BSOD problems) despite normal temperature but I think that 75ºC or hotter may affect performance. In Portugal, the temp of my room is +/-17ºC but it’s cold weather due to almost winter. I got max 78ºC (1 or 2 minutes) at FAN auto default after 2 or 3 times of test. Do you have same problem with GTX 480 and/or GTX 580 at auto FAN speed? I can improve much to this result because I think very likely new GeForce driver 320.49 (or CPU changed from AMD X6 1055T to i5-2500K).